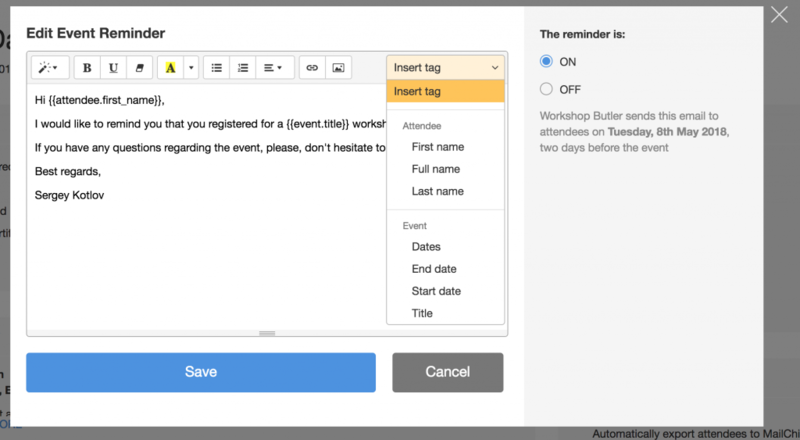 Two days before an event, Workshop Butler sends an automatic reminder to your attendees. Here is an example. I'd like to remind you that you are registered for Workshop Butler Demo event on September, 28th. If you have any questions regarding the event, please, do not hesitate to contact me. You can do it by replying to this email. Notice: the language of event reminder depends on the language of your event, and your settings. To customize the reminder, find Mails tile on the event dashboard and click Edit in Event Reminder section. If you do not want to send the reminder to attendees, you can switch it off by selecting the option the sidebar and clicking Save. To simplify the personalization of the content, use email tags. Before sending a message, Workshop Butler looks for the tags in an email’s body and replaces them with relevant values. You can find available tags for event reminder in the select box in the top right corner of the editor. When you duplicate an event, the event reminder is not copied. You need to update it for each event manually.